Cthulhu Saves The World is not your average RPG because for the first time ever, you are Cthulhu himself! Courtesy of the same people who developed Breath of Death VII which I haven’t heard of before. Oh well, it’s not like that game was a prequel to this one or anything. If you looked at the Steam page, you’ll notice that it’s a parody of old-school adventure games from the age of the NES. Even the cutscenes are a throwback to the days when storytelling was done akin to a visual novel, taking place in a 16-bit, top-down world. The first hilarious moment had to be when the narrator admits Cthulhu must become a true hero to get his evil powers back which is irony at its finest. The game promised us an epic tale of romance, redemption, and insanity, to which I must give it credit for delivering all three. I can guarantee it will turn cliches on its head and at times, comment on its self-awareness. I didn’t expect the screen to be set at such a small resolution but I stopped noticing it after I got into the monster hunting and leveling. The selection menu has a bunch of different game modes you don’t need to worry about because you’ll have to unlock them anyway. I wouldn’t bother with the bonuses until you complete the game in story mode at least once. 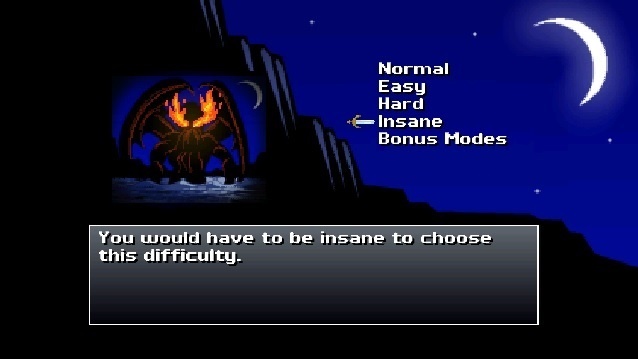 The game has four difficulty levels to choose from. Easy is for the faint of heart, normal is requires planned strategy but is doable, hard is for the daring who don’t mind hitting several game-overs. I’d stay the hell away from Insane mode if I were you. Rumor has it, on bonus modes, you could start as a different party member. I’m pretty sure Cthulhu isn’t supposed to be able to hear the narrator speak. 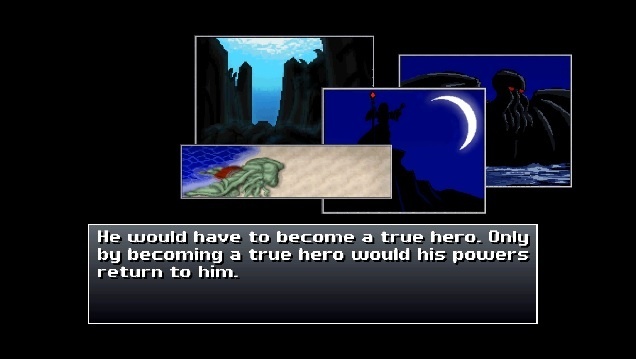 And the poor guy just revealed how Cthulhu can regain his full power which is good because the player will be led through the tutorial, but is also bad given that Cthulhu will eventually destroy the world when he meets the heroic deeds quota. At this point, Cthulhu is already trolling Steam players by calling out people who resell video games to make a quick buck. 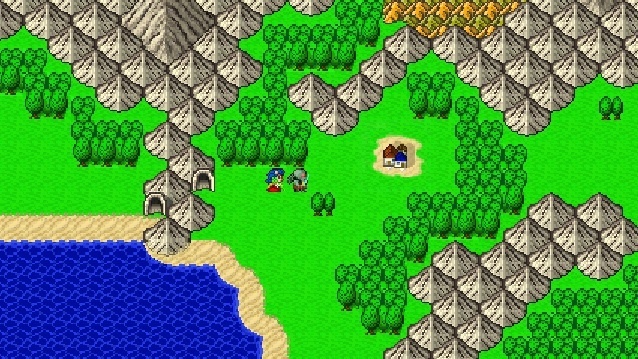 It’s true that the option to run exists so that people can save time on exploring the overworld and survive the monotonous grinding integral to RPGs. When you have to fight monsters, you get to decide if you want to hit only one creature or unleash an AOE (area of effect) attack. The controls are simple enough: You’re able to check your stats or talk to a party member using the menu interface. You also have the ability to fight local monsters at will. To go back to previous places, you can teleport to a city you’ve already visited. 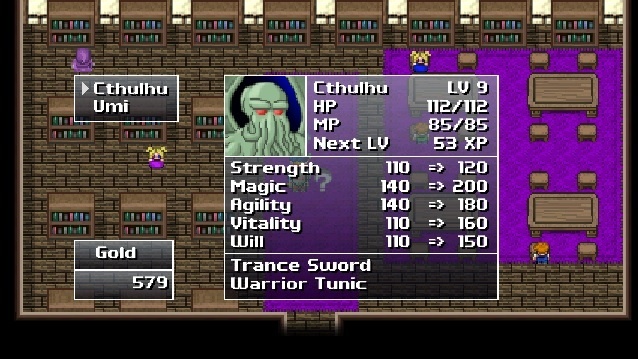 Cthulhu and his groupies can equip better armor and weapons with special stats. Monsters are depicted with their own pop-culture references and cheesy puns, whichever you prefer. 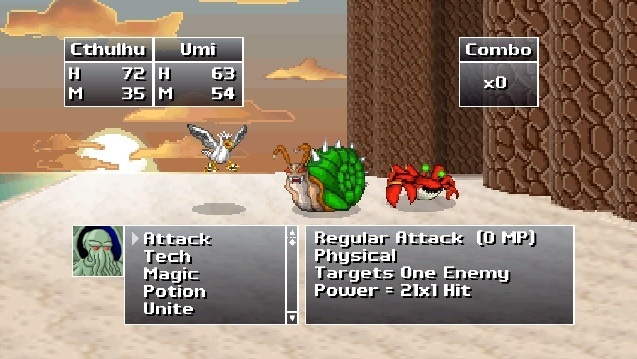 The combat sequence is entirely turn-based, where the damage output is determined by Cthulhu’s stats. He is capable of granting insanity to an opponent which causes them to enrage, becoming more vulnerable to attacks. A basic attack is like swinging your sword so having higher STR (Strength) makes Cthulhu stronger. The Insanity element brings down their defenses but it’s too tough to use when enemies become stronger by 10% each turn. Tech stands for techniques, relying on other stats like MAG (Magic) or AGI (Agility) to unleash a combo strike against your foes. Some of them do heavy damage as combo finishers while others are effective at stunning plus adding insanity to a tough monster or for targeting multiple enemies at once. You might need to raise their defenses with Protect and Dodge if you are dealing with a tough boss. The downside is that it drains MP to prevent you from spamming them willy-nilly. Magic spells enable you to do heavy damage by blasting a foe with a Fireball or a Dark Blast later on. Umi, your first party member, is a healer who restores HP to one character. A lot of spells inflict elemental damage from shooting lightning to causing an earthquake, thus it’s best to save them for dire situations. 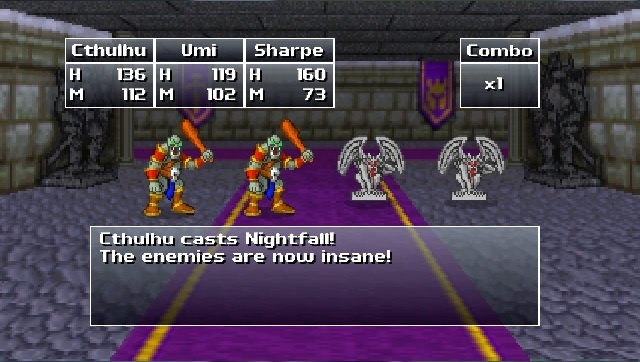 As you level up, you get to decide what kind of abilities and status buffs Cthulhu and his teammates should receive, depending on how you want to build a party of heavy hitters, tanks, healers, or magic users. 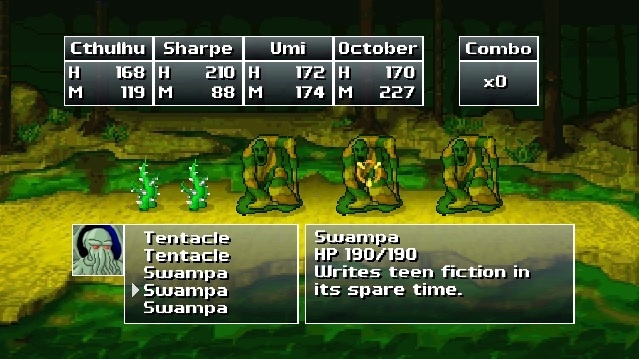 You can use potions in battle if Cthulhu or Umi are low on health but they aren’t easy to restock until you reach a town shop. Now, I will explain how these stats contribute to combat. Strength increases the power of your physical attacks. Magic attributes to a higher damage output from techniques and spells you can cast in one sitting. Agility determines who gets to go first in a battle. Vitality raises your defense against physical attacks. Lastly, Will protects you from incoming magic attacks. Treasure chests contain armor and weapon upgrades to give you an advantage over higher level creatures and are vital to beating the bosses. I’m not a huge fan of the grinding for monster encounters, but I have to admit, finding a well-hidden treasure chest is worth the effort. It’s easy to get lost inside dungeons because all the passages look nearly the same. You could be running in circles which makes me wonder why the Devs didn’t give the player a map. I barely scraped by, nearly drained of MP due to the high encounter rate. The tough part is remembering to save multiple times in case you run out of spells or techniques to use on strong enemies. You may get 1-Ups but the “game overs” are just around the corner. It’s a good thing towns contain save points to restore you back to full. Having a sound strategy in mind will ensure all your party members stay alive for the entire duration of the battle. Bosses are granted the privilege of speaking lines. The very first (and weakest) boss fight pits you against these three standard RPG classes: The Hero (warrior), the Cleric (healer), and the Thief (rogue). 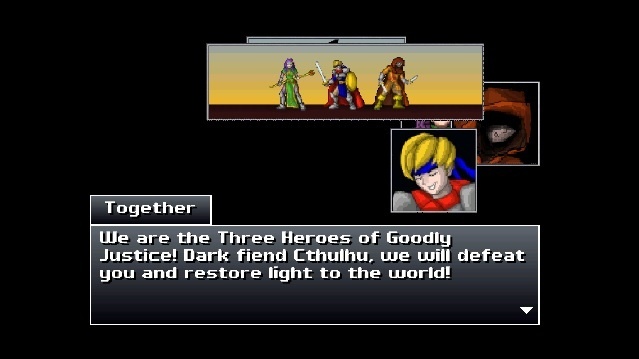 While Cthulhu is the protagonist, other heroes will still regard him as an evil being that needs to be purged thanks to that whole “destroy the world” prophecy. Boss fights are trickier since you can’t just spam the same regular attacks over and over, nor is it smart to waste your strongest attacks right off the bat. You have to consider who is better at taking hits and who is adept at magic. Techniques are useful for debuffing your foes, sometimes letting you stun them to last a few rounds. You have the option (before it all started), to turn on the developer’s notes. If you’re curious as to who brought this game into existence, then enjoy reading the snippets from the author himself. 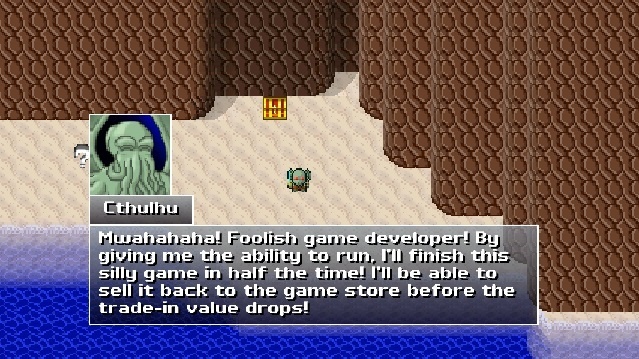 Cthulhu Saves the World has a lot of easter eggs to uncover. He points out how the beta version differs from the released final product. After you clear an area, you can move onto the next one. The map has small landmarks that indicate the type of terrain you’re standing on. The creatures you run into depends on if you’re walking in the forest or over the sandy beaches. The main quest is pretty straight-forward as the game outright tells you where to go. The previous map represents the entire world, and to their right is a small village. 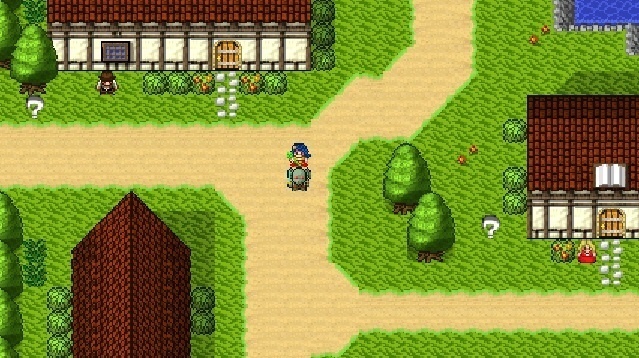 The village is a safe zone for you to restore health and save your game. You could read a book or two but otherwise, there isn’t much except for buying weapon and armor. Most NPCs don’t do anything besides react to Cthulhu’s presence. The best part has to be when you recruit new members into Cthulhu’s party. (Aka his groupies.) Your first magic user is Umi, the blue-haired girl who has a crush on Cthulhu. The next one is literally a sharp sword who is built for heavy defense. 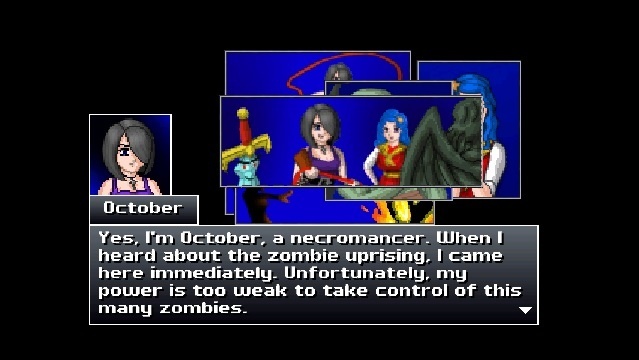 My favorite character has to be October because of her huge MP pool. I can use her to cast powerful group targeting spells like Earthquake and Fireball or one-shot a strong creature after everyone else had their turns. 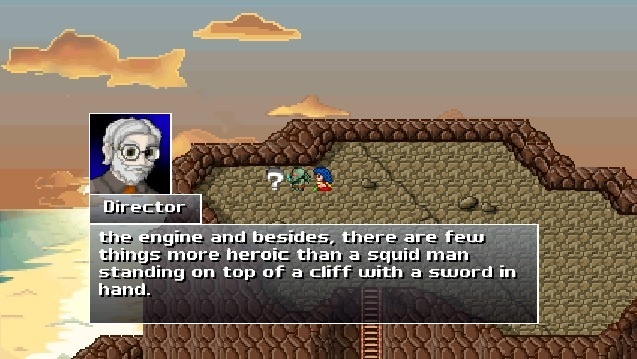 Anyway, I’ll just end this review by pointing out that Cthulhu Saves the World is a short and sweet game about turning Cthulhu the destroyer into a famous hero. 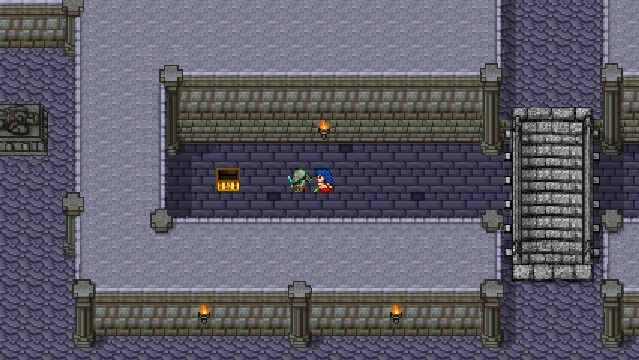 If you like old school turn-based RPGs, then this one is worth checking out.